Ready to Learn – All Students will arrive to school with the appropriate appearance, attitude and approach that makes them ready to learn. Respectful – Our school values the dignity of each member of its community. Students should show respect to each other and to staff. Responsible – Students conduct and behaviour in school should be calm and harmonious, a positive climate for learning. Mobile phones if seen or heard outside the ‘Responsible Use Zones’ will be confiscated. They may not be used in ‘No Phone Zones’. Music devices, games devices or any device deemed to have a negative impact on learning will be confiscated. Headphones are not permitted to be worn in corridors. Energy drinks are not permitted in the school. Sweets and items deemed unhealthy by the school are discouraged. Bags used for school must be a suitable size and strong enough to carry books and other equipment. Illegal items or other drugs/substances. Not have extreme haircuts – this includes colours and cut. Not wear any footwear such as training shoes, canvas pumps and any other footwear not approved of by the school. Eat only in the canteen and designated outside eating areas. 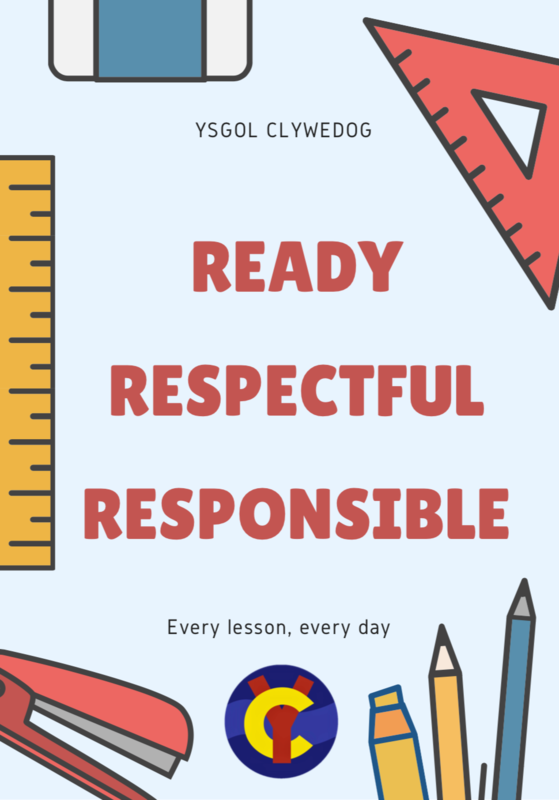 Not engage in any commercial activity on Ysgol Clywedog premises. Not wear hats or scarves in the building. Respect property belonging to others. Do not bring valuables or money into the school. Should you need to bring money into the school bring the smallest amount possible. Do not bring expensive items of clothing and equipment into the school. The school will not be liable for any damage or loss. Ask your Head of Year or Form Tutor if you need clarification on any issue. While students are travelling to and from the school they are representing the school and must act in a manner that does not damage the school’s reputation. Students should respect the people and property in the local community and behave in a safe and sensible manner. Students who misbehave while travelling to and from the school will be subject to the school’s sanctions. Students’ behaviour outside of school that has an effect upon the education and welfare of students within the school will also be subject to disciplinary proceedings. We value our students’ experiences both inside and outside of the school and as such we will expect our students to behave in a manner that promotes Ysgol Clywedog. However on occasions students’ behaviour may not be up to standard and as such they will be subject to action from the school. Section 89(5) of the Education and Inspections Act 2006 gives Headteachers the power to regulate students’ conduct when they are not on school premises and are not under the lawful control or charge of a member of school staff.